Beer arrived in Australia at the beginning of British colonisation. In 2004 Australia was ranked fourth internationally in per capita beer consumption, at around 110 litres per year; although, the nation ranked considerably lower in a World Health Organization report of alcohol consumption per capita of 12.2 litres. Lager is by far the most popular type of beer consumed in Australia. The oldest brewery still in operation is the Cascade Brewery, established in Tasmania in 1824. The largest Australian-owned brewery is the family-owned Coopers Brewery, as the other two major breweries Foster's Group and Lion Nathan are owned by the South African SABMiller and the Japanese Kirin Brewing Company, respectively. Within an alcoholic beverage market worth some $16.3 billion, beer comprises about 48% compared to wine at 29% and spirits at 21%. Within the beer sector, premium beers have a 7.8% share of the market; full strength beer has 70.6%; mid-strength holds 12%; and light beer has 9.6%. 85% of beer is produced by national brewers, the remainder by regional or microbreweries. Microbreweries manufacturing less than 30,000 litres receive a 60% excise rebate. Beer was still being consumed on-board two years later in 1770, when Cook was the first European to discover the east coast of Australia. If ye'll only gimme Rum! The first official brewer in Australia was John Boston who brewed a beverage from Indian corn bittered with cape gooseberry leaves. It is likely though that beer was brewed unofficially much earlier. The first pub, the Mason Arms was opened in 1796 in Parramatta by James Larra, a freed convict. "Drunkenness was a prevailing vice. Even children were to be seen in the streets intoxicated. On Sundays, men and women might be observed standing round the public-house doors, waiting for the expiration of the hours of public worship in order to continue their carousing. As for the condition of the prison population, that, indeed, is indescribable. Notwithstanding the severe punishment for sly grog selling, it was carried on to a large extent. Men and women were found intoxicated together, and a bottle of brandy was considered to be cheaply bought for 20 lashes... All that the vilest and most bestial of human creatures could invent and practise, was in this unhappy country invented and practised without restraint and without shame"
"The introduction of beer into general use among the inhabitants would certainly lessen the consumption of spirituous liquors. I have therefore in conformity with your suggestion taken measures for furnishing the colony with a supply of ten tons of Porter, six bags of hops, and two complete sets of brewing materials." Although modern Australian beer is predominantly lager, early Australian beer were exclusively top-fermented and quick-maturing ales. Lager was not brewed in Australia until 1885. Early beers were also brewed without the benefit of hops, as no-one had successfully cultivated hops in Australia and importation was difficult. James Squire was the first to successfully cultivate hops in 1804, and he also opened a pub and brewed beer. The Government Gazette from 1806 mentions that he was awarded a cow herd from the government for his efforts. In September 1804, a government-owned brewery opened in Parramatta, followed by a rival privately owned brewery three months later. The government brewery was sold two years later to Thomas Rushton, who was its head (and only) brewer. Brewing rapidly expanded in all of the Australian colonies and by 1871 there were 126 breweries in Victoria alone, which at the time had a population of only 800,000. 1824 – Peter Degraves starts the Cascade Brewery in Hobart. It is Australia's oldest operational brewery. 1835 – Tooth brewery established in Sydney. 1837 – James Stokes establishes the Albion Brewery, Perth's first brewery, which later became the Emu Brewery. 1838 – John Warren starts "The Torrens", Adelaide's first brewery. 1838 – John Mills establishes the first brewery in Melbourne. 1853 – Queensland's first brewery, "The Brisbane Brewery" is opened by John Beach. 1862 – Thomas Cooper establishes the Coopers Brewery in the Adelaide suburb of Norwood. The brewery continues to be owned and operated by the Cooper family, and since 2011 has been the largest Australian-owned brewery. 1864 – Carlton brewery opens in Melbourne. 1881 – CS Button opens the Esk Brewery in Launceston (acquired by James Boag & Son in 1883). 1885 – Gambrinus brewery in Melbourne becomes the first brewery in Australia to brew lager. 1887 – The Foster brothers arrive from New York with refrigeration equipment and establish the first lager brewery to use refrigeration in Australia. 1889 – Lager is first brewed in Queensland at the Castlemaine and Quinlan brewery. By 1900 the number of breweries had begun to dwindle as a result of the recession of the 1890s. In 1901, just after Federation, the new federal government passed the Beer and Excise Act. This act regulated the making and selling of beer and made homebrewing illegal. The provisions in this act, regarded by many as draconian, led to the closure of many breweries. In Sydney 16 out of 21 breweries closed either immediately after the act's introduction or soon afterwards. The remaining breweries began a process of consolidation, with larger breweries buying out the smaller ones. Within a short period of time, only two breweries remained in Sydney: Tooths and Tooheys. In Melbourne, five breweries merged in 1907 to form the giant Carlton and United Breweries. Since 2011, Kirin-owned Lion Co and Abi-owned Foster's Group own every major brewery in Australia, with the exception of Coopers. Boag's Brewery, previously owned by San Miguel, was sold to Lion Nathan for A$325 million in November 2007. In 2006 Boag's Brewery reported total revenues of A$92 million. Although Foster's Lager is not a popular domestic beer in the 21st century, its popularity internationally has grown and the product is made mostly for export. In January 2005, the brand was one of the ten best-selling beers globally. The introduction of the Tap King product by Lion Nathan in mid-2013 caused controversy due to the perceived impact upon alcohol venues. The product is a home draught beer dispenser and raised concerns regarding lower patronage rates for venues due to a greater incentive for consumers to drink beer in home environments. The product is sold with a CO2 gas chamber that is cooled for eight hours prior to use. Before federation in 1901, Australia was a patchwork of separate colonies, each with different laws regulating the production and sale of alcohol. In addition, until the late 1880s when the rail network began to link the capital cities together, the only means of transporting foods in bulk between the colonies was by sea. This prevented even the largest breweries from distributing significant amounts outside their home city. 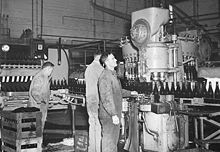 This allowed strong regional brands to emerge; and, although all but one of the major regional brands (Coopers) are now owned by multinational companies, loyalty to the local brewery remains strong today. While Foster's Group owns many of these brands, Foster's Lager itself is not considered a local drink anywhere in Australia. We're a small brewery run by two former homebrewers who, for 15 years, have been making the kinds of beers that we like to drink. Most breweries brew to a formula, something born in a focus group or in a marketing team meeting. We come up with our ideas at the bar. Microbrewery Nail Brewing, from Perth, Western Australia, produced a beer in 2010 using water from an Antarctic iceberg, and sold it at auction for US$1,850. The batch of 30 bottles was created to raise money for the Sea Shepherd Conservation Society, which assisted with the procuring of the ice. Imported premium beers have started to gain market share in Australia. The two Australian corporate brewers responded to this by signing licence agreements with foreign brands to brew their beers here. Foster's Group brews Kronenbourg. Coopers Brewery brews Carlsberg in Australia. Lion Nathan locally produces Guinness, Heineken, Beck's, Stella Artois and Kirin. Brewers claim that their locally produced product tastes better because it is fresher, and local operations are overseen by the parent brewers using strict guidelines. However, groups such as the Australian Consumers Association say that such beers should have clearer, more prominent labels to inform drinkers. Prior to metrification in Australia, one could buy beer in glasses of size 4, 5, 6, 7, 9, 10, 15 and 20 (imperial) fluid ounces. Each sized glass had a different name in each Australian state. These were replaced by glasses of size 115, 140, 170, 200, 285, 425 and 570 ml. As Australians travel more, the differences are decreasing. In the 21st century, most pubs no longer have a glass smaller than 200 ml (7 imp fl oz); typically available are 200 ml, 285 ml and 425 ml, and increasingly many pubs now have pints (570 ml, 20 imp fl oz). It is also common for pubs and hotels to serve a large jug which will be filled to approximately 1100ml. Many imported beers are served in their own branded glasses of various sizes, including 250 millilitres (8.8 imp fl oz), 330 millilitres (11.6 imp fl oz) and 500 millilitres (17.6 imp fl oz) for many European beers. ^ Entries in bold are common. ^ Entries in italics are old-fashioned or rare. ^ Entries marked with a dash are not applicable. ^ The "fl oz" referred to here is the imperial fluid ounce. ^ Prior to metrification, the butcher was 6 fl oz. ^ a b c Confusingly for visitors, South Australians use the same names for different volumes than in the other States. ^ A modern glass size, mainly used with European beers. While the glass may be 350ml, a 330ml or 300ml fill line is common. With the increasing popularity of European beers, glasses of size 250ml and 500ml are also becoming more prevalent, but as yet don't seem to have acquired "names". ^ a b Traditionally, 425 ml is a size not found in Western Australia and Victoria. Which Size Beer Do Ya Want, Mate? With the introduction of the National Trade Measurement Regulations in 2009 there are no prescribed sizes for beverage measures for the sale of beer, ale and stout. Terms such as seven, middy, pot or schooner do not legally specify a particular size. A typical "schooner" glass can be calibrated to hold 420ml to the rim but poured with 15mm of head resulting in 375ml of liquid. 6 fl oz (170 ml) – prior to metrification this glass was known as a "Butcher"
10 fl oz (285 ml) known as a "schooner". Prior to metrication and standardisation of glass sizes throughout Australia, schooners in SA were 9 fluid ounces. 15 fl oz (425 ml) known as a "pint"
20 fl oz (570 ml) known as an "imperial pint"
the SA "pint" (425 ml) is the same size as other States' schooner, and is 0.75 imperial pint. Usage and understanding of these names is now generally restricted to people born before about 1960. (i.e. "Baby Boomers" and before.) In contemporary SA pubs and restaurants, the most frequent measures are the "schooner" of 285 ml, (an "imperial half pint"), and the "pint" of 425 ml. "Imperial pints" are also increasingly popular. Also increasingly popular inside pubs and restaurants is the sale of "premium" and non-locally brewed beer in bottles in the size range 300 ml to 375 ml. Headmasters is one of the most common glass manufacturers, at least for the schooner size. Many pubs in Sydney and Melbourne particularly, offer Guinness style and/or conical pint glasses along with tankard glass and British dimpled glass pint mugs. Larger serving measurements have become increasingly popular. Jugs, 1 fluid litre Maß in German-themed bars and beer towers (although technically illegal due to strict self-service of alcohol laws are used in some Asian bars/karaoke parlours) have grown in popularity around Australia in tourist spots. Prior to metrication, beer bottles were frequently 1⁄6 of an imperial gallon (26.7 imp fl oz; 757.7 ml); a carton of beer contained a dozen bottles, and hence 2 gallons of beer. With time, bottles "shrank" to 26 imperial fluid ounces (739 ml), but with metrication they became 750 millilitres (26.4 imp fl oz), with a carton containing 9 litres (1.98 imp gal) of beer. With the use of aluminium, cans of 375ml became increasingly popular, and then 375ml bottles, named "stubbies" because, compared to "traditional" bottles, they were "stubby". A carton of 9 litres of beer in stubbies (24 bottles) became known as a "slab" because, compared to the more cube-like shape of the "traditional" cartons, they were flatter and hence like slabs. Traditional bottles subsequently became known as "long necks" or "tallies", to distinguish them from stubbies. In Western Australia, the 750ml "long neck" bottle is also known as a "king brown" because of the size and typical brown coloured glass. In the 21st century, most bottled beer in Australia is sold in 250 ml (Throwdown/Twist Top), 375 ml (Stubby) or 750 ml (Long Neck) sizes. Carlton United briefly "upsized" to 800 ml; however, this has since been reduced to the original 750 ml. Bottle sizes of 330 ml (and to a lesser extent 345 ml and 355 ml) are becoming increasingly common, particularly among microbreweries, so-called "premium" beers, and imported beers. (Bottles imported from the United States typically contain 12 US fluid ounces (355 ml).) In the Northern Territory, the once-common "Darwin Stubby", a large (2.0-litre) bottle, is now sold largely as a tourist gimmick, but very successfully. Most bottles are lightweight "single use only", though some are still reusable, and in some cases (e.g. Coopers 750 ml), breweries are reintroducing refillable bottles, such as the Growler (a large bottle of approximately 2 litre intended for re-use) sold by Four Pines Brewery - a boon to home brewers. In South Australia, container deposits on beer bottles and cans, and some other types of beverage containers, support a well established network of recycling centres, providing significant environmental benefits as well as generating employment opportunities for unskilled workers. ^ Per Capita Beer Consumption by Country (2004) Archived 23 June 2008 at the Wayback Machine, Table 3, Kirin Research Institute of Drinking and Lifestyle - Report Vol. 29–15 December 2005, Kirin Holdings Company. ^ "Australian Beer". Beer & Wine Guide. 2018-01-04. Retrieved 2018-12-28. ^ "Aussies drinking less beer - and getting choosier". FoodWeek Online. 29 October 2008. Archived from the original on 16 April 2009. ^ Robert Hughes (1987). The Fatal Shore (Random House 2010 reprint ed.). Alfred A. Knopf. p. 292. ISBN 9781407054070. Retrieved 2 June 2014. ^ Illis, Judith. "Australian Dictionary of Biography (Online Edition)". Boston, John (?–1804). Australian National University. Retrieved 20 January 2016. ^ Alison Painter (2001). "Breweries and Beer". Wakefield Press. Updated 10 December 2013. ^ a b Coopers. "Coopers". /static/. Retrieved 17 October 2016. Today, Coopers stands proudly as the sole major brewer 100% owned by Australians, and holds over 5% of the Australian beer market. ^ a b Willie Simpson (25 January 2005). "Beauty bottlers". Sydney Morning Herald. Retrieved 10 October 2013. ^ Colin Kruger (8 November 2007). "Lion Nathan bags James Boags for $325m". Sydney Morning Herald. Retrieved 10 October 2013. ^ Matt Shea (9 October 2013). "Tap King: Beer of the Future or Frothy Fail?". The Vine. Digital Media. Archived from the original on 9 October 2013. Retrieved 10 October 2013. ^ Garrett Oliver (2011). The Oxford Companion to Beer. Oxford University Press. pp. 370–371. ISBN 978-0-19-536713-3. ^ Erika Bolden (4 September 2012). "Q & A With Australian Brewery Mountain Goat Beer: Surfboards as Collateral + The Influence of American Craft Beer". LA Weekly. LA Weekly, LP. Retrieved 10 October 2013. ^ "A tactical but non-nuclear whale of an ale". Australian Brew News. Cuneiform Pty Ltd. 1 November 2010. Retrieved 10 October 2013. ^ MAANVI SINGH (9 October 2013). "Meet Dave, A 19-Year-Old Craft Beer With A $2,000 Price Tag". NPR. NPR. Retrieved 10 October 2013. ^ Greenblat, Eli (24 August 2009). "Premium beers cause for cheers". The Age. Melbourne. Retrieved 23 October 2010. ^ "Carlsberg Group - Australia and New Zealand". www.carlsberggroup.com. Retrieved 4 August 2015. ^ Russell, Mark (21 December 2008). "Is that a foreign beer or a case of brewer's dupe?". The Age. Melbourne. Archived from the original on 17 March 2011. Retrieved 23 October 2010. ^ "Beer Size Guide to Australian Beer Measurements". 16 September 2009. Retrieved 17 June 2017. ^ "Alcohol". www.measurement.gov.au. Retrieved 2017-09-15. ^ Dr Brett J. Stubbs (9 June 2012). "Take a butcher's hook at the butcher glass". Australian Brews News. 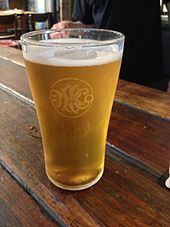 Wikimedia Commons has media related to Beer in Australia. 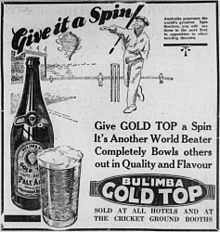 Wikimedia Commons has media related to Breweries in Australia.